Contarino was Gov. Bill Richardson’s campaign manager. That campaign, of course, folded in early January following twin disasters in Iowa and New Hampshire. But ever so often I — and I’m assuming hundreds if not thousands of others — still get these e-mails. The latest came this week. “Dear Steve,” the latest missive began. You have to love that personal touch. Most of the e-mails I get from widows of Nigerian generals usually start out with something like “Hello dear,” which is more intimate, but I get the feeling they say that to all the boys. But back to my Contarino message. 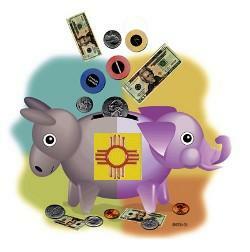 According to his most recent campaign finance report, filed last month, Richardson reported $420,848 in debts. A major portion of that debt is the need to refund contributions that supporters made for a Richardson general election campaign that never happened. Under federal law, individual contributions to a candidate are limited to $2,300 for the primary election and $2,300 for the general. That allows well-heeled supporters to throw in $4,600, which beefs up the candidate’s financial reports. Apparently there’s no mechanism to prevent candidates from spending their general election money on the primaries. But, under the law, those candidates who don’t make it to the general election have to refund that “general election” money. According to his latest report, Richardson refunded $788,730 to those who contributed to his general election. Apparently some people take these pleas to heart. 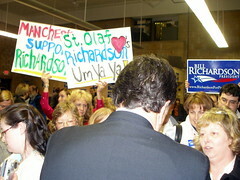 According to his latest report, Richardson raised some $57,000 in new contributions in February. Changing the race: “We changed this race in important ways that will truly make a difference to our country,” Contarino says in the message. “Now, both Democratic candidates are committed to ending the war in Iraq and getting all of our troops out. “Now, both Democratic candidates are committed to charting a new energy future for America. Of course, some might argue that Barack Obama and Hillary Clinton might have espoused such positions even if Richardson never had been in the race. Speaking of Obama, nowhere in the e-mail is Richardson’s endorsement of the Illinois senator mentioned. I wonder how much money will pour in from Clinton backers. “The goal of all of us who worked so hard on the governor’s campaign now is to ensure a Democrat gets elected in the fall and to make sure that Democrats control our national agenda starting next year,” the e-mail said. I’m just wondering whether this really be the “last request” from the Richardson campaign. 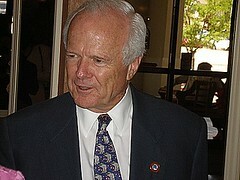 Dendahl still opining: Former State Republican chairman John Dendahl lost the 2006 gubernatorial race to Richardson. Then he moved from his hometown of Santa Fe to Colorado. But if you thought Dendahl was leaving politics or keeping his opinions to himself, think again. The always-quotable “Gentle Jawn,” as Ernie Mills used to call him, writes an occasional article for a conservative Web site called Family Security Matters, which is associated with a Washington, D.C.-based think tank called Center for Security Policy founded by neo-conservative leader Frank J. Gaffney Jr.
Dendahl has written for the publication for several years now. His latest piece, published last month, is a blistering critique of Obama’s race speech.